In the past month, two different federal circuits held that Seattle’s Yellow Pages are noncommercial speech (Dex Media West v. Seattle) and a Texas trial lawyer’s website address is (probably) commercial speech (Gibson v. Tex. Dept. of Ins.). These divergent rulings, and the differing level of First Amendment protection they impose, reinforce Washington Legal Foundation’s long-held opinion that the U.S. Supreme Court must reconsider its “commercial speech doctrine.” Below, we offer some thoughts on a different approach. Line Drawing. U.S. Supreme Court precedent requires judges to draw lines around speech when analyzing government restrictions. Court rulings in 1976 and 1980 determined that speech which does “no more than propose a commercial transaction” is entitled to less First Amendment protection than “pure” political speech. Some communications, such as advertisements, obviously fit on the “commercial” side of the line. But other speech isn’t so easily categorized, leading to needlessly convoluted judicial review which can silence or chill valuable speech. What are the Yellow Pages? For instance, in Dex Media West, the Ninth Circuit had to categorize Seattle’s Yellow Pages, the distribution of which the city wanted to curtail for environmental reasons. 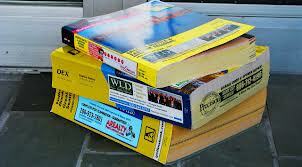 Common sense may dictate that the Yellow Pages are quintessentially commercial. But the circuit court concluded that the existence of some noncommercial information – maps, individuals’ phone numbers, government office locations – in the Yellow Pages rendered the entire volume noncommercial. The court could have stopped there and struck down the Seattle distribution restrictions as unconstitutional. Instead, it went on and discussed the Supreme Court’s complex jurisprudence on the “inextricable intertwining” of commercial and noncommercial speech. The two different types of speech were clearly intertwined and could not be unwound, the court reasoned, because the ads subsidized the noncommercial items. Seattle has asked the Ninth Circuit to grant en banc review of the three-judge panel’s ruling. A Different Approach. The need to sort speech into Supreme Court-created boxes, and the analytical gymnastics required when it doesn’t fit neatly, can inspire a great deal of harmful censorial mischief. The First Amendment and those whose rights it protects deserve a better approach. Does the speech being regulated directly relate to the characteristics of a product or service offered for sale? Does the challenged government restriction seek to address speech proposing an illegal transaction or speech that is false or misleading? Regulations that don’t meet both conditions should be reviewed under strict scrutiny. Such an approach will permit government to police the free market by targeting false or misleading commercial information which harms competition and disserves consumers. It will also prevent government from inappropriately regulating speech to achieve policy goals unrelated to the speech. Goals such as environmental protection (the justification for Seattle’s ordinance in Dex Media West), promoting temperance (Rubin v. Coors; 44 Liquormart), and lowering healthcare costs (Sorrell v. IMS Health) may be compelling state interests, but none relate to preventing false or misleading commercial information. This approach should also ensure that businesses can publicly oppose PR attacks on their brand without the fear of being sued for false advertising under state laws, as happened in 2002’s Nike v. Kasky. There, the California Supreme Court labeled Nike’s statements countering allegations of abusive overseas labor practices as “commercial speech,” and allowed private lawsuits to proceed. The Supreme Court failed to correct this miscarriage of justice, so the chilling precedent endures. Recalibration of constitutional doctrine does not come easily at the Supreme Court, nor should it in most instances, but in the interests of Americans’ most cherished right — freedom of speech — the effort must be made.